Strip Easy is a high performance, low odor, non-corrosive, ammonia free wax and finish remover formulated for use with or without scrubbing machine. It easily penetrates through heavy finish build-ups. Strip Easy is suitable for use on a variety of floors. This product can be diluted in either hot or cold water withour effecting its performance. In a few easy steps you can have a bare floor that is ready for a new finish. 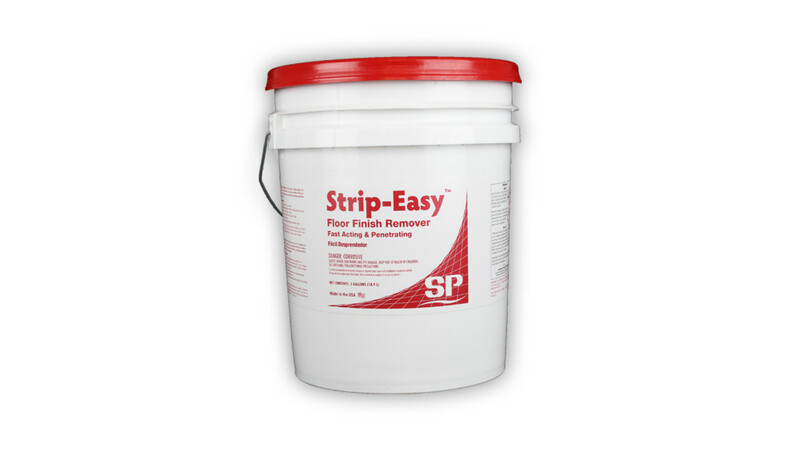 Strip Easy is a non-ammoniated, solvent-free, finish remover with low odor. With this lack of smell in the air, the usual complaints that arise from floor stripping are reduced. Dilute Strip Easy up 1 to 4 with water. Apply the diluted solution directly to the floor, scrubbing vigorously with a mop or stripping pad. Allow to remain 5-10 minutes. Remove with a mop, wet vacuum or automatic scrubber. Rinse twice with clean water. Let the floor dry thoroughly before applying new finish or sealer.